Once again we’re going to you show some of the best watersports gear that you can buy online for an affordable price without sacrificing on quality. This time we turn our attention to wetsuit boots. Wetsuit boots are often called a variety of names, the most common being wetsuit shoes, wetsuits booties or sometimes even surf shoes. So don’t worry if you’ve heard them called something else before, and forgive us if we use a few of those throughout this guide. If you’ve ever walked across a pebbly beach without anything on your feet, or you’ve headed into the sea to find out the sand from the beach quickly turns into sharp stones, you have probably thought to yourself ‘I should buy some of those waterproof shoes for next time’. You’re not the only one. And that’s why we’re here: to help make that painful under-foot beach experience a thing of the past. 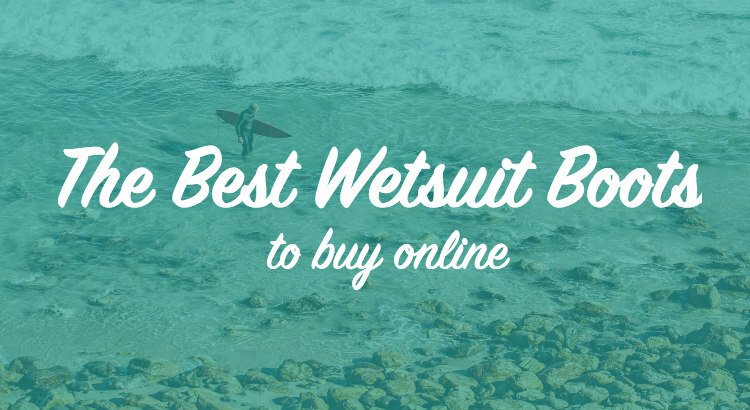 We’re going to show you some of the best wetsuit boots to buy online and hopefully help you understand the differences between the different types. 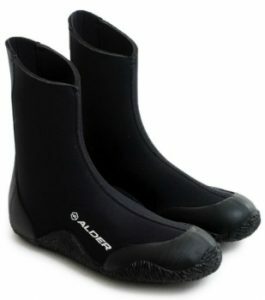 We’re going to get straight into our recommendations of the best adults wetsuit boots to take a look at and buy online. Many manufacturers provide their boots for all adults in all adult sizes, rather than slitting into men’s and women’s boots. We’ll be sure to tell you when a certain boot isn’t suitable for either men or women and give you a clear rundown of the different features of the shoes. In our recommendations we’ve included both boot and shoe style, so you can select the style that will suit you best. 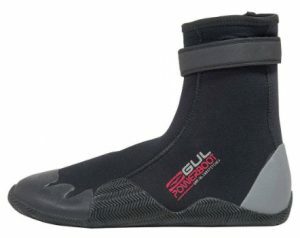 Gul are a leading name in wetsuit clothing, providing quality water wear for many years and building up a reputation for producing reliable surfing gear. Built from Dura-Flex neoprene, the boots provide ample flexibility and manoeuvrability while fitting well and reducing water in-flow with the adjustable ankle strap. The 5mm Dura-Flex T2 Neoprene in the adult boot ensures great flexibility and the boot is designed to be snug fitting to minimise water ingress. 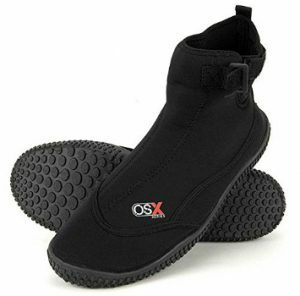 If you’re looking for comfort and protection, the Osprey OSX boots are a great option with a slightly thinner 3mm neoprene thickness. 3mm is the most popular thickness for wetsuits as it provides both warmth and flexibility. The same goes for wetsuit shoes too – your feet will be protected from the cold, but the shoes won’t be too bulky. These Osprey wetsuit boots feature an ankle strap for a secured fit that will help keep water out of the boots. The seams of the boots are flatlock seams, meaning that there is no raised line where the stitched seam is, keeping the shoes comfortable against your feet and preventing rubbing. 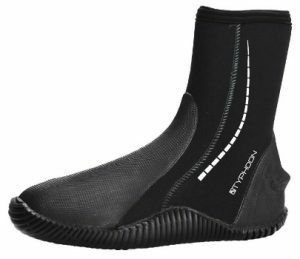 The first 5 out 5 scoring boot on our list is the Basic HD wetsuit boot from SEAC, a robust looking boot that scores perfectly with those have purchased, tried and tested them. Rather than a strap, the Basic HD features a side zip making it easier to get the boots on and off, even with they’re wet. The sole of the boots is a hard sole, adding extra protection to your feet from sharp rocks or any potential puncturing. With a 5mm thickness, the Basic HD will offer plenty of warmth, keeping you comfortable and protecting your feet for longer. Check out the Amazon question and answers for more accurate sizing. Although Mares have listed these as the Men’s Classic boots, don’t worry ladies, they’re available from size 3, so even the smallest of adult feet will be suitable for these. 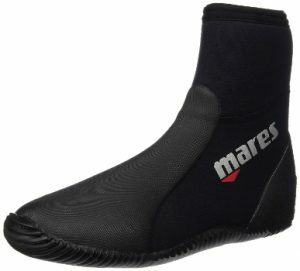 These Mares boots are made from 5mm thick neoprene, offering a lightweight boot that provides a high level of thermal protection while reducing chafing and irritation. The boot shape of the Classic NG has been manufactured to provide a comfortable fit while the zip ensures the boots are easy to get on and off, while providing a tight fit. The molded sole provides protection and flexibility for your entire foot, from the heel to the toes. The boots are fitted with anti-abrasion panels which means they will be long lasting but also help to provide a better fit. By far the thickest boots on our recommendation list, the Typhoon Surfmaster is a 6.5mm thick, robust and hardwearing boot. That is ideal for colder temperatures and using for extended amounts of time in the water. Once again, the Surfmaster boots feature zips on the inside of the boots making it easier and quicker to take the boots off and put them back on again. The rubber sole of the foot moves with your foot, making the boots more comfortable and durable, whilst providing large amounts of grip, even on wet and slippery terrain. The Alder Edge is a zipped wetsuit boot made from 5mm neoprene that features a flexible, robust sole that provides warmth and protection even in colder temperatures. These boots deliver high-quality performance from a well-designed boot that features a glued and blindstitched construction. Being glued rather than stitched means there are fewer entry points for water to come into the boot, keeping your feet drier and warmer for longer. There is reinforced material through the bottom of the boot on the heel, toe and instep, once again increasing the comfort and protection offered by the Adler Edge. If you’re looking for a bit more freedom, wetsuit shoes below the ankle might suit you better than the boot style. If you’re looking for a cheap and cheerful, pulls no punches, no-frills wetsuit shoe, then the Hot Tuna Slasher could be the ideal option for you. With a rubber sole and neoprene top, the Splasher provides protection for your feet from sharp stones or stings, while keeping your feet warm within the shoes. With a zip entry for easier access and elasticated ankle, these shoes reduce water in-flow and allow you to take them off easily even when wet. The Splasher wetsuit shoes are available from sizes child 3, right up to adult 11 and available in a wide range of colours and designs, so if you wanted to kit out your whole family with cheap yet quality wetsuit shoes, you could do so with the Hot Tune Splasher. O’Neill are one of the biggest names in surf and skate clothing all around the world. When you tune in to any surf event, it’s highly likely that you’ll see the O’Neill brand worn by competitors and spectators alike. 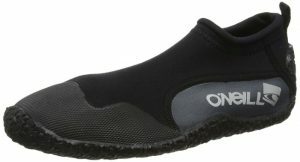 The Reactor wet shoes from O’Neill are a 2mm, highly responsive and flexible shoe that will protect your feet and provide plenty of grip when you’re in the sea or on the beach. The front of the shoes feature a 2mm liquid foam protective layer to support your toes with the rest of the shoe featuring 2mm neoprene throughout to provide water resistance and warmth. Available in all black or charcoal variation. 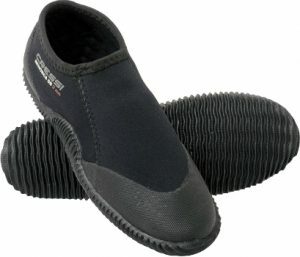 The Cressi Minorca is 3mm thick neoprene shoe that is suited to warm and cold temperature water. The Minorca shoes have been designed to be as lightweight as possible to make it as easy as possible to pack and travel with the shoes. With elasticated tops, the shoe conforms to the shape of the top of your foot/bottom of your ankle providing a snug fit and keeping out water. Available in black, blue or pink to meet your own individual tastes (and so you know which shoes belong to you! ).